Put simply, myofascial trigger points are painful, hyper-irritable areas in muscles that cause pain, stiffness, limited range of motion and sometimes other symptoms. They can refer pain to other parts of the body - sometimes very far from their original location. As a result they are often misdiagnosed. Myofascial trigger points are a very common problem that can lead to severe pain and other puzzling symptoms, which are often misdiagnosed. Trigger points are always created in certain places in a muscle and always refer pain to the same areas. However, because there are hundreds of muscles in the body, there are hundreds of possible locations for trigger points. Also, trigger points in one muscle tend to create trigger points in other nearby muscles. 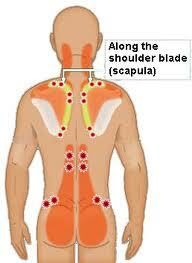 Myofascial trigger points are classified as either active or latent (inactive). Latent ones do not cause pain, but can still reduce range of motion. An active trigger point is easy to recognize by pressing on it, because it feels very painful. Often it is also palpable as a small "knot". Repetitive movements and prolonged use of the same muscles are common causes of trigger points. However, a sedentary lifestyle is also a risk factor. As a result pretty much any job can cause trigger points, whether it involves physical labour or prolonged sitting or standing. Poor posture promotes trigger points, but the reverse is also true. Physiotherapy is the best treatment for chronic pain.